When Planet x it comes its gravitational pull tilts the earth a bit resulting in earthquakes, tsunamis and crazy weather conditions. There are some estimates saying 95% of life on the surface of earth is wiped out by Nibiru and make the planet earth a very undesirable place to colonize it might explain why there are so many undergound tunnels that are being found all over the world. But the ice on Hartley 2 is composed of water that matches the chemistry of the Earth’s oceans. Hartley 2 probably came from the Kuiper belt, 1,000 times closer to Earth. This could explain the very different composition of its water ice. The Kuiper belt is much larger than the asteroid belt, so the discovery, reported online on Wednesday in Nature, greatly enlarges the possible sources of Earth’s water. W"e have to try to confirm this with other comets to see whether their composition is the same as Hartley 2," said the lead author, Paul Hartogh, a researcher at the Max Planck Institute for Solar System Research in Germany. But, he added, "This finding means that models of the formation of the solar system may have to be revisited." Vulcan Related Meteor Or Comet Swarms. There are four or five periodic comet swarms generated by Vulcan, although Kuiper or Scatter disc objects are drawn into the inner solar system all along Vulcan's orbit as Vulcan's presence cancels the angular momentum of these objects. Vulcan ranges from about 130 AU to 448 AU distant. Occasionally, some of these comes impact Earth. These are the comets that have generated Earth's oceans. The Kuiper belt sometimes called the Edgeworth–Kuiper belt, is a region of the Solar System beyond the planets extending from the orbit of Neptune (at 30AU) to approximately 50 AU from the Sun.It is similar to the asteroid belt, although it is far larger—20 times as wide and 20 to 200 times as massive. However, studies since the mid-1990s have shown that the classical belt is dynamically stable, and that comets' true place of origin is the scattered disc, a dynamically active region created by the outward motion of Neptune 4.5 billion years ago; scattered disc objects such as Eris have extremely eccentric orbits that take them as far as 100 AU from the Sun. The scattered disc (or scattered disk) is a distant region of the Solar System that is sparsely populated by icy minor planets, a subset of the broader family of trans-Neptunian objects. The scattered-disc objects (SDOs) have orbital eccentricities ranging as high as 0.8, inclinations as high as 40°, and perihelia greater than 30 astronomical units (4.5×109 km; 2.8×109 mi). These extreme orbits are believed to be the result of gravitational "scattering" by the gas giants, and the objects continue to be subject to perturbation by the planet Neptune. While the nearest distance to the Sun approached by scattered objects is about 30–35 AU, their orbits can extend well beyond 100 AU. This makes scattered objects "among the most distant and cold objects in the Solar System". The innermost portion of the scattered disc overlaps with a torus-shaped region of orbiting objects traditionally called the Kuiper belt, but its outer limits reach much farther away from the Sun and farther above and below the ecliptic than the belt proper. Because of its unstable nature, astronomers[who?]. now consider the scattered disc to be the place of origin for most periodic comets observed in the Solar System, with the centaurs, a population of icy bodies between Jupiter and Neptune, being the intermediate stage in an object's migration from the disc to the inner Solar System. Eventually, perturbations from the giant planets send such objects towards the Sun, transforming them into periodic comets. The downpour resembles our own solar system several billion years ago during a period known as the "Late Heavy Bombardment," which may have brought water and other life-forming ingredients to Earth. Now Spitzer has spotted a band of dust around a nearby bright star in the northern sky called Eta Corvi that strongly matches the contents of an obliterated giant comet. This dust is located close enough to Eta Corvi that Earth-like worlds could exist, suggesting a collision took place between a planet and one or more comets. Eta Corvi is an F-type main sequence star, the sixth-brightest star in the constellation of Corvus. Two debris disks have been detected orbiting this star, one warm within a few AU and another out at ~150 AU. The IRAS satellite detected an excess of infrared radiation from this star, beyond what would normally be expected for a stellar object of this class. Observations in the submillimetre band confirmed the presence of excess dust in orbit around the star having about 60% of the mass of the Moon and a temperature of 80 K.
Since the Poynting-Robertson effect would cause the dust in the outer disk to spiral in to the star within 20 million years, much younger than the age of the system, the observed presence of dust in the outer disk means that it must be constantly replenished. It is thought that this happens by the collisions of planetesimals orbiting at a distance of about 150 A.U., which are repeatedly broken down into smaller and smaller pieces, eventually becoming dust. In 2010-2011, Dr. Carey Lisse of the Johns Hopkins University Applied Physics Laboratory in Laurel, MD, USA and his group  analyzed the Spitzer IRS 5 – 35 um spectrum of the warm, ~360K circumstellar dust and found that it showed clear evidence for warm, water- and carbon-rich dust at ~ 3 AU from the central star, in the system’s Terrestrial Habitability Zone (THZ), uncoupled and in a separate reservoir from the system’s extended sub-mm dust ring at 150 ± 20 AU. Located in a thin layer at intermediate depths in the disc, the cold vapour hints at a much larger reservoir of water ice hidden deeper in the disc and amounting to several thousand times the mass of water that makes up our planet's oceans. The discovery sheds new light on the presence and role of water in the early formation stages of a planetary system. By using the cold vapour signature to trace the total water content in the disc, this study demonstrates for the first time that a protoplanetary disc can harbour such large amounts of water ice. This study focussed on the protoplanetary disc surrounding TW Hydrae, a 10- million year old T Tauri star with a mass of 0.6 times the Sun's mass. Located about 175 light-years away, TW Hydrae's disc is one of the closest to Earth and thus one of the best studied among protoplanetary discs. A mysterious little world nicknamed "Snow White" is covered in ice and may sport the wispy remnants of an atmosphere, a new study of a dwarf planet that lies outside Neptune has found. Even though Snow White — officially known as 2007 OR10, and orbiting the sun as part of the Kuiper belt — is actually red, half of the surface is covered by water ice that probably spewed from ancient cryovolcanoes, researchers said. The dwarf planet's reddish hue likely comes from a thin layer of methane, the last gasps of an atmosphere that has been bleeding off into space for eons. The dirty snowballs known as comets might be the sources of Earth's water after all, scientists say. Now Earth-like water has been discovered in the small oddball comet Hartley 2, which the Deep Impact/EPOXI spacecraft flew by in November 2010. This comet originated in the disk-shaped Kuiper belt, a region of the solar system beyond the orbit of Neptune, suggesting this is ultimately where much of Earth's water came from. "When the Earth formed it was so hot that most volatiles escaped to space, so when the Earth cooled down it was dry," said study lead author Paul Hartogh, a planetary scientist at the Max Planck Institute for Solar System Research in Katlenburg-Lindau, Germany. "Water and other volatiles must have been delivered at a later stage." Now researchers find that water seen in Comet Hartley 2 is very close to Earth's, with about 1,610 deuterium atoms per 10 million regular hydrogen atoms. "With our finding it may be that more than 10 percent and perhaps all water on Earth possibly stems from comets," Hartogh told Space.com. It may be that all bodies in the inner solar system get their water from these comets. Sampling a larger number of comets for their deuterium-hydrogen ratios could shed light on the matter, Hartogh said. Even industrialised countries are vulnerable from factors such as climate- induced water shortages and rising food prices, he says. “The critical point is that many organisms are already at their environmental limits, and natural selection won’t necessarily rescue them,” Grosberg said. A dazzling aurora light show amazed skywatchers across North America, from Canada to Arkansas, and other northern regions Monday night (Oct. 24), painting the sky with striking green and even rare red hues. The aurora display, also known as the northern lights, was touched off by a wave charged particles unleashed by a massive sun storm on Saturday, which took two days to reach Earth, according to the Space Weather Prediction Center operated by the National Weather Service and NOAA. "These were the most vibrant I've ever seen," Canadian skywatcher Colin Chatfield of Saskatoon, Saskatchewan told SPACE.com in an email. "I was also able to see red with the naked eye, which I've never seen before either. Simply put, they were amazing." The magnetic pole is moving at about 40 miles per year toward Russia. So why is it getting colder during Global Warming? The answer may lie in particle physics. Recently several individuals contributed to establishing a natural climate change model. These studies have focused on the Sun's influence on climate change. Pang & Yau (2002) studied solar irradiance and strongly correlated this data with Northern Hemisphere temperatures from the years 1620 to 1980. Willson (2003), using satellite observations of Total Solar Irradiance (TSI), has observed a 0.05 percent increase per decade in the Sun's radiant energy since 1970, which can account for some of the uptick in global temperature rise. These studies provide a foundation for the development of a natural climate change model. Another component in the natural climate change model lies in particle physics. In 1894, Charles Wilson began researching water droplets that make up clouds. He developed a device called a cloud chamber, which allowed him to reduce the air pressure of a humid environment. He discovered that charged particles traveling through the chamber left a trail of condensed water droplets. He received a Nobel Prize in 1927 for inventing the bubble chamber. The Earth's environment functions like a cloud chamber. But the Earth's magnetic field shields the planet from charged particles, which are deflected towards the Poles, where the cold temperatures produce low humidity levels that inhibit cloud formation. The Earth's magnetic field has been on the decline. Recently, the decline has become very pronounced. Using the International Geomagnetic Reference Field (IGRF) data set, the magnetic field at the equator in open ocean has declined 1.7 percent in intensity since 1980. (Geomag program, IGRF dataset, latitude 0 degrees, longitude 180 degrees, sea level, years 1980-2005, a decline from 34,824 to 34,246 nanoTesla (nT)). Whereas the entire decline over the period from 1900 to 1980 was 2.8 percent. As the Earth's magnetic field weakens, charged particles from outer space and from the Sun will find it easier to break through the magnetic shield that protects Earth. These particles then interact with humid air in tropical, subtropical and mid-latitude environments to produce tiny water droplets that become basic building blocks in forming clouds. Increased cloud formation can result in increased global rainfall and snowfall totals. The clouds also moderate Earth's temperature by reflecting solar radiation. There was a 60 degree rotation of the Earth's core c1970. An increase in the Sun's radiant energy (possibly starting around 1970 when the Vulcan web site speculates that Vulcan passed aphelion) combined with a weakening of the Earth's magnetic field may account for current unusual weather patterns. The Earth' magnetic field may no longer be as protective as it was from shielding lower latitudes from an increased level of solar radiation particles, and these are interacting with Earth's atmosphere altering weather patterns. The magnetic field has weakened by 15 per cent over the last 200 years. And this, scientists claim, could be a sign that the Earth’s magnetic poles are about to flip. “This is serious business,” Richard Holme, professor of Earth, Ocean and Ecological Sciences at Liverpool University told the Daily Mail. Researchers predict that in the event of a flip, every year a hundred thousand people would die from the increased levels of space radiation. One side of Earth's solid inner core grows slightly while the other half melts.Peter Olson and Renaud Deguen of Johns Hopkins University in Baltimore, Maryland, used numerical modelling to establish that the axis of Earth's magnetic field lies in the growing hemisphere – a finding that suggests shifts in the field are connected to growth of the inner core. The north magnetic pole is moving at 37 miles-a-year toward Russia, which means they're stealing it. Or the Earth's core is fluxing. Actually, nobody really knows what's happening. I just hope it's not a prelude to a catastrophic magnetic shift. If the first theory finally happens, the whole process will have catastrophic consequences to human civilization and nature. Without a magnetic field, nothing will protect us against space radiation. The weather will go completely gaga, and the Sun will fry all our communications and navigation services, not to talk about all of us. At the same time, countless migrational species will get lost, affecting food chains and causing mayhem through the entire planet. Rapid changes in the churning movement of Earth's liquid outer core are weakening the magnetic field in some regions of the planet's surface, a new study says. "What is so surprising is that rapid, almost sudden, changes take place in the Earth's magnetic field." The findings suggest similarly quick changes are simultaneously occurring in the liquid metal, 1,900 miles (3,000 kilometers) below the surface. The swirling flow of molten iron and nickel around Earth's solid center triggers an electrical current, which generates the planet's magnetic field. Fluctuations in the magnetic field have occurred in several far-flung regions of Earth, the researchers found. In 2003 scientists found pronounced changes in the magnetic field in the Australasian region. In 2004, however, the changes were focused on Southern Africa. ALERT! ALERT! WAKE UP!! SCIENTISTS THINK THE MAGNETIC POLES ARE REVERSING!!! A MAGNETIC REVERSAL IN PROGRESS? - ? Although a total flip may be hundreds or thousands of years away, the rapid decline in magnetic strength is already damaging satellites. An asteroid splashdown in one of Earth's oceans could trigger a destructive chemical cycle that would wipe out half the ozone layer, according to a new study. The massive loss of protection against the sun's ultraviolet (UV) radiation would likely force humans into a vampire-style existence of staying indoors during daylight hours. Model results showed a 0.3-mile asteroid that hit at a latitude 30 degrees north in the Pacific Ocean in January would lead to a local impact on the ozone layer — though "local" still meant an ozone hole that spread across the entire Northern Hemisphere. By contrast, the 0.6-mile asteroid strike led to a worldwide drop in UV protection — at which point the "hole" ceases to be a hole. If a medium-sized asteroid lands in the ocean, tsunamis won't be the only worry. A new computer simulation suggests that the water vapour and sea salt thrown up by the impact could damage the Earth's protective ozone layer, leading to record levels of ultraviolet radiation that could threaten human civilisation. To get a sense of how much water might be jettisoned into the atmosphere if these asteroids hit the ocean, the team modelled what would happen if they reached Earth's atmosphere at a clip of 18 kilometres per second, an average speed expected for a near-Earth object, and hit the ocean in the northern hemisphere at a 45-degree angle. As expected, the simulations showed that the larger, 1-km asteroid created the bigger splash, throwing 42 trillion kilograms of water and vapour – enough to fill 16 million Olympic-sized swimming pools – across an area more than 1000 kilometres wide and up to hundreds of kilometres above the Earth's surface. Once in the atmosphere, the water, together with compounds containing chlorine and bromine from vaporised sea salts, destroyed ozone above the Earth's atmosphere at a much faster rate than it is naturally created. The longest lasting and most severe depletion – a cut of more than 70 per cent in ozone levels – occurred over much of the northern hemisphere. While people may be able to protect themselves from the increased threat of sunburn, the intense UV light could also affect our food supply by damaging plants and the phytoplankton that represent the bottom of the ocean's food chain. "That is enough to really cause problems for our civilisation," Pierazzo says. Toon notes that impacts on land or shallow water may ultimately do more damage by kicking up dust that could significantly darken skies and inhibit plant growth. Pierazzo is now working on a model to assess how asteroids that hit dry land would affect the atmosphere. The Earth's magnetic field takes an average of only 7000 years to reverse its polarity, but the switch happens much more quickly near the equator, according to the most comprehensive study yet of the last four reversals. Clement found that the duration of the transitions varied with latitude, from 2000 years near the equator to 11,000 years nearer the poles. Would be every 2500 years, but a significant impact does now always happen. THE SUN FLIPS ITS MAGNETISM. Incidentally, our beloved Earth also flips its magnetic polarity. The time- period is less regular, with intervals 5 thousand years to 50 millions years apart. The last reversal happened 7,40,000 years ago, and some scientists feel the next reversal is overdue. Nobody knows when, and what would be its impact on life on Earth. The next column in this series will cover what may happen when our Earth flips it. EARTH'S MAGNETIC POLES ON VERGE OF FLIPPING? A geologist says there are signs the North Pole is about to flip to the South Pole. He claims changes in the way molten iron is flowing in the Earth's core could trigger a switch. Experts at the Physics of the Globe Institute of Paris and the Danish Space Research Institute in Copenhagen carried out the comparison and say the magnetic field off the southern tip of Africa has already flipped. - Summary : - Evidence exists that the poles have changed position during the past ages. This possibility, however, so far has been disregarded on the basis that such a phenomenon is thought to be physically impossible. The following article shows the possibility of very rapid shifts of the poles due to the impact of astronomical objects as small as a half-kilometer diameter asteroid. Acording to the Vulcan web site, the inner core of the Earth first changes its magnetic orientation. Then the strike of a meteorite orients the magnetic domains of the material in the Earth's crustal regions. Thus, the meteorite strikes "cement" the changed magnetic field. An interesting aspect of his arguments is the derivation of the size of asteroid needed to cause a polar shift. The way in which Dr. Barbiero determines the size of the impactor needed to cause pole shifting is not only incorrect, but it completely ignores the physical processes by which cratering occurs. It fails to provide any justification for the minimumsize of the meteorite needed create the torque which he claims is needed for pole shifting. EVEN if we knew precise details of Earth's core, we would not be able to predict a catastrophic flip in the polarity of its magnetic field more than a decade or two ahead. Our planet's magnetic field has reversed polarity from time to time throughout its history. Some models suggest that a flip would be completed in a year or two, but if, as others predict, it lasted decades or longer we would be left exposed to space radiation. This could short-circuit satellites, pose a risk to aircraft passengers and play havoc with electrical equipment on the ground. The earth's molten core can change rapidly in response to forces still unrecognized. Mountain rocks are not faithful recorders of the geomagnetic field (undermines, the whole field of paleomagnetism). If the flip-over of the Earth's magnetic field is overdue, how long do you estimate it will be before it eventually happens? EPISODE OF STEEP GEOMAGNETIC INCLINATION All scenarios of crustal plate motion may have to be modified substantially. Magnetic quiet periods coincide with fast seafloor spreading. During these periods, buoyant spreading ridges displace seawater into broad shelves, thus decreasing earth's albedo and causing global warming. Temperature gradients, and thus density gradients, from pole to equator decrease in surface waters, and the deep ocean currents of oxygenated polar waters wane. Oxygen minimum zones intensify and widens. EARTH'S MAGNETIC FIELD JERKS It now seems almost certain that around 1969 a spectacular change took place in the geomagnetic field. The change was almost synchronous over the whole of the Earth's surface, took place in less than two years, and is now known to have consisted of a 'jerk'. BEHIND MAGNETIC FLIP-FLOPS Taking a different tack, D. Gubbins has investigated the possibility that field reversals are triggered by ice ages and meteorite impacts (tektite falls). The physical mechanism here would be the increase in pressure upon the core, which affects the rate of freezing in the outer core, and thus the power available to the core dynamo. THE MAGNETIC JERK PROBLEM While most geophysicists acknowledge that something significant happened to the core in 1969, the geographical extent of the "jerk" is unclear. The acceleration of the field was clear cut in Europe but obscure or undetectable over much of North America. Previous research had shown that the Earth's core rotates faster than the rest of the planet. However, scientists from the University of Cambridge have discovered that earlier estimates of 1 degree every year were inaccurate and that the core is actually moving much slower than previously believed – approximately 1 degree every million years. Their findings are published today, Sunday 20 February, in the journal Nature Geoscience. "This result is the first observation of such a slow inner core rotation rate," said Waszek "It therefore provides a confirmed value which can now be used in simulations to model the convection of the Earth's fluid outer core, giving us additional insight into the evolution of our magnetic field." The inner core in our simulation initially rotated between 2 and 3 degrees longitude per year faster than the solid mantle and surface. This prediction in 1995 for the Earth motivated two seismologists from Columbia University in early 1996 to search for evidence of this super-rotation in 30 years of seismic data. They found evidence that supports our prediction and published it in July 1996, (Figure 4b). More recent simulations of ours that now include a simple parameterization for the gravitational coupling that may exist between the mantle and the inner core have a much smaller inner core rotation amplitude; however, this rotation is still predominantly eastward relative to the model Earth's surface. US scientists claim to have confirmed that the Earth's core is spinning faster than its outer layers. The results show that the inner core is rotating faster than the rest of the planet by about 0.009 seconds per year. Earth has a solid inner core made of iron and nickel that is about 2,400km in diameter and a fluid outer core about 7,000km in diameter. This so-called "superrotation" of the inner core is of the order of 0.3 degrees to 0.5 degrees each year. This means that in 900 years, the inner core would gain one full rotation on the rest of the planet. The research could help test simulations of how the outer, fluid core generates the Earth's magnetic field, which shields our planet and the teeming life on it from harmful cosmic rays. The surface movement is called plate tectonics. It involves the shifting of about a dozen major plates and is what causes most earthquakes. "We're talking about 50,000 times that of plate tectonic motion," Song told LiveScience. Walker Circulation, its effects are felt worldwide -- as disruptive El Niño episodes, seasonal Asian monsoons and the upwelling of cold water from the deep ocean that nourishes marine food chains. He will warn core scientific values are "under serious threat from resurgent fundamentalism, West and East". Lord May will say that fundamentalism applies not only to organized religions but to lobby groups on both sides of the climate change debate. The climate change "denial lobby" and non-governmental organizations (NGOs) opposed to nuclear power are not exempt from a denial or misrepresentation of scientific facts, he told reporters in London. "We are witnessing enormous changes, and it will take some time before we understand how it happened, although it is clearly a result of warming around the glaciers,"
Dr. Daniel Fagre, a federal research scientist based at Glacier National Park in Montana, says that in 1850, the park had 150 glaciers. Today, because of global warming, there are only 27 left, with estimates that all the glaciers in the park will be gone by the year 2030. "It would take a pretty substantial climate change to bring our glaciers back. We would have to get a lot of moisture and it would have to get cooler," says Fagre. "So I don't think that we'll see much of a change in the next few decades." A mysterious phenomenon is causing four major glaciers in the Antarctic to shrink in unison, causing a significant increase in sea levels, scientists have found. The rise in atmospheric temperatures caused by global warming cannot account for the relatively rapid movement of the glaciers into the sea, but scientists suspect that warmer oceans may be playing a role. "There is a possibility that heat from the ocean is somehow flowing in underneath these glaciers, but it is not related to global warming," said glaciologist Duncan Wingham of University College London. "Something has changed that is causing these glaciers to shrink. "At this rate the glaciers will all be afloat in 150 years or so." He says the currently used method of determining the global temperature -- and any conclusion drawn from it -- is more political than scientific. The argument is presented in the Journal of Non-Equilibrium Thermodynamics. The first study to combine computer models of rising temperatures with records of the ancient climate has indicated that sea levels could rise by up to 20ft (6m) by 2100, placing millions of people at risk. Fifty-five million years ago the North Pole was an ice-free zone with tropical temperatures, according to research. DR PETER COX: 2040 it could be four degrees warmer, the climate change could have led to big drying particularly in the Amazon Basin, that would make the forest unsustainable, we'd expect the forest to catch fire probably, turn into savannah and maybe ultimately even desert if it gets really really dry as our model suggests. One of the reasons the loss of the planet's ice cover is accelerating is that as the poles' bright white surface disappears it changes the relationship of the Earth and the sun. Polar ice is so reflective that 90 percent of the sunlight that strikes it simply bounces back into space, taking its energy with it. Ocean water does just the opposite, absorbing 90 percent of the light and heat it receives, meaning that each mile of ice that melts vanishes faster than the mile that preceded it. His apocalyptic vision of thousands dead and millions homeless is a different side of the persona he established as head of the hurricane center. Mayfield attained national celebrity status during the tempestuous 2004 and 2005 seasons, appearing on network television with hourly updates as hurricanes Charley, Ivan, Frances and Wilma bore down on the Caribbean and the Southeast. His calm demeanor and avuncular sincerity endeared him to millions of TV viewers seeking survival guidance. The technology exists to build high-rise buildings capable of withstanding hurricane-force winds and tropical storm surge more powerful than those experienced in the last few years. Much of Hong Kong's architecture has been built to survive typhoons, and hotels and apartments built in Kobe, Japan, after a 1995 earthquake devastated the city are touted as indestructible, he said. New Orleans residents were ordered to evacuate the city today as Hurricane Katrina, one of the most powerful and potentially deadly storms ever to threaten the U.S. Gulf Coast, approached land with its 175 mph. The great magnetic jerk of 1970 rotated the Earth's core by about 60o and it slowed to about 2o or 3o per year by the 1990's. Now it is down to about 0.3o to 0.5o. Viscous forces are slowing it down to match the rotation of the Earth's liquid center regions. But in doing so, heat is created and that heat is working its way out through volcanic action and through the thin part of the Earth's crust below the oceans. Thus the oceans are warming and spawning more violent hurricanes. Records for the past 35 years show that hurricanes have got stronger in recent times, according to a global study. The number of severe hurricanes has doubled worldwide even though the total number of hurricanes has dropped over the last 35 years, a new study finds. The increase in major storms like Katrina coincides with a global increase of sea surface temperatures, which scientists say is an effect of global warming. "On the face of it, global warming can only make things worse," says science author Fred Pearce in the latest issue of New Scientist. "The initial pillar of humid air generally forms only when the temperature of the sea surface exceeds 26C. As the oceans warm, larger areas will exceed the threshold. And every degree above the threshold seems to encourage stronger hurricanes," he says. More fuel was added to the fire of the debate in September when meteorologist Peter Webster of the Georgia Institute of Technology in Atlanta and his colleagues published data showing that the frequency of category four and five cyclones - the two strongest types of hurricanes - had increased significantly over the past 35 years. All this is happening as sea surface temperatures have risen across the globe anywhere from around one-half to 1 degree Fahrenheit, depending on the region, for hurricane seasons since the 1970s (after the core rotation in 1970.). IS GOD TRYING TO TALK TO SOMEBODY IN THE US? Amos 9:6b: He calls for the waters of the sea and pours them out on the land. The Lord is his name. Psalm 104:3? : He makes the clouds his chariot and rides on the wings of the wind. He makes winds his messengers, and flames of fire his servants. Think Oversoul, not God. Given particular conditions, it is expected that the sea ice in the North Pole region will completely melt in the summer. Extreme weather events in Europe will increase in frequency and strength. Oregon oddity could be another volcano in the making. BEND, Ore. - A recent survey of a bulge that covers about 100 square miles near the South Sister indicates the area is still growing, suggesting it could be another volcano in the making or a major shift of molten rock under the center of the Cascade Range. Heat from the Earth's core? Judging from the large magnitude and relatively rapid evolution of the observed J-2 changes, one possible cause could be net material flow driven by the geodynamo in the fluid outer core and along the core-mantle boundary. There is evidence of a substantial geomagnetic jerk in 1999. Such jerks have been associated with flow acceleration in the top of the core, in addition to long- term magnetic dipole changes. Could they be related? To date, no correlation has been demonstrated between the geomagnetic observations and the observed J2 . However, a review of geodynamo simulation results indicates that the core models can possibly explain J-2 changes ?depending on the modeling assumptions." So, what do our professors indeed know? Next to nothing. In short, the scenario is as follows: a solid central core rotates in the center of the earth. It is surrounded by a liquid iron-like layer, on top of which the earth's crust is continuously drifting. This whole structure therefore appears to be a huge rotating dynamo. In addition, the liquid layer rotates in the electrostatic field of the sun, recharging itself. However, this is not at all efficient: more electrical potential is lost than gained. Just like a battery that is almost empty, it is difficult to recharge and it becomes exhausted more easily and quickly. This is the situation with the "battery" of the magnetic field of the earth. For this reason one sees the force of the magnetic field diminishing, almost 60% over the last two thousand years. GEOMAGNETIC REVERSALS FROM IMPACTS ON THE EARTH A review the evidence tying geomagnetic reversals to the impacts of large bodies with the earth. The climate changes; biological extinctions occur, etc. A physical mechanism for geomagnetic reversals is proposed. It has moved about 5 degrees eastward. The pole, which, unlike the geographic North Pole, is in constant movement, has been within modern Canadian borders since at least the 1600s -- the time of Shakespeare and Sir Isaac Newton. In 1904 it was measured just off the northern tip of Nunavut's King William Island by Norwegian explorer Roald Amundsen, and since then has moved in a north to northwesterly direction at a stately 10 kilometres per year. But in 2001, scientists discovered that it was picking up the pace, suddenly charging ahead -- and toward the edge of Canadian territory -- at more than 40 kilometres per year. This year, bad weather prevented Newitt from reaching the actual location of the pole, and he hasn't completed the analysis of his observations. But he got close enough to make two measurements, and says it appears the pole is farther away than expected, and moving even faster than before. "We landed at two places at around 83 North, and it certainly appears the pole is probably closer to 84 North," he said. "That means that the pole is still continuing to accelerate." If the pole continues its current course, it will shoot across the top of Earth and end up in Siberia by mid-century. WHO ARE BEGINNING TO UNDERSTAND HOW IT BEHAVES AND WHY. The pole kept going during the 20th century, north at an average speed of 10 km per year, lately accelerating "to 40 km per year,"
But there is also evidence for more frequent episodes when the magnetic poles have moved a large distance -- 45 degrees or more away from the geographical pole -- then returned. These events, known as 'excursions', are rather like failed attempts at reversal. When they occur, the strength of the magnetic field falls dramatically as well, by a factor of 5 or 10. Professor Gubbins has drawn on recent experimental results, particularly those from a research group in Utrecht headed by Dr Cor Langereis, which clearly identify six relatively recent magnetic excursions as true global phenomena. All the excursions lasted roughly the same length of time -- about 5,000 years. Physicists and geologists at Trinity College in Dublin have found new evidence for the existence of magnetism in carbon by examining a meteorite that crashed into the Arizona desert some 50,000 years ago. Michael Coey and colleagues examined fragments from the Canyon Diablo meteorite and found that only about two-thirds of the magnetization could be accounted for by the magnetic minerals present in the sample. This means, they say, that the rest of the magnetization is somehow associated with the carbon in the meteoritic graphite nodule. When physicists say "teleportation", they are describing the transfer of key properties from one particle to another without a physical link. Mr Ursin said a next step towards worldwide quantum communication would be to attempt the teleportation of quantum states between particles using a satellite link. This may similar to the 'link' between Vulcan, the Sun and the planets of our solar system. It operates on the Primordial Black Hole seeds of these bodies and influences their magnetic fields. Now, Van der Voo and colleague Trond Torsvik of the Geological Survey of Norway have found a way to reconcile the paleomagnetic data with the classical Pangea A model. The key, they say, lies in assumptions about Earth's magnetic field. Scientists generally have assumed the field is like that of a dipole, an object such as a bar magnet, with north and south magnetic poles. That view is not exactly correct -- the field does have some non-dipole components today -- but because those components vary from century to century, they have been presumed to cancel out over long spans of time. But suppose, says Van der Voo, "that the main magnetic field wasn't what we have always assumed as perfectly dipolar -- that there was a longstanding non-dipolar field that did not get averaged out." If that were true, positions indicated by paleomagnetic data would be slightly different from those that assume a purely dipolar field. Sure enough, when Van der Voo and Torsvik performed an analysis they found long-term non-dipole fields, and inclusion of these fields produced a near perfect continental fit with the Pangea A model. ALMOST INCONCEIVABLE CHANGES IN THE GEOMAGNETIC FIELD. The Earth's geomagnetic field has be found to change as rapidly as 6 degrees per day corresponding to Figure10. 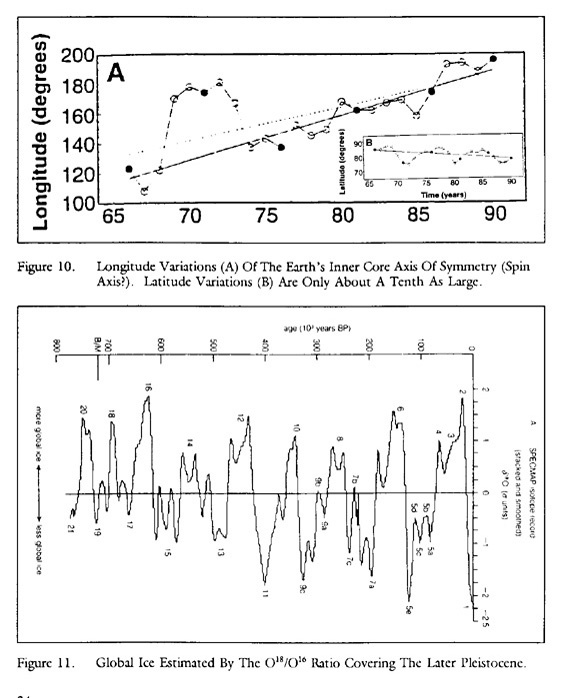 Rapid Rotation of the Earth's Inner Core of the ANALYSIS section of the 1997 Paper. In the first place, it is almost certain in my opinion that a very great cataclysm or catastrophe occurred . . . by which the mammoth with his companions was overwhelmed over a very large part of the earth's surface. This catastrophe, secondly, involved a widespread flood of waters which not only killed the animals but also buried them under continuous beds of loam or gravel. Thirdly, that the same catastrophe was accompanied by a very sudden change of climate in Siberia, by which the animals that had previously lived in fairly temperate conditions were frozen in their flesh under the ground and have remained there ever since. Collapse of Giant Ice Age Glacial Lake responsible for carving out the Bahamas. A team of researchers have uncovered evidence that a Mega-Flood, or series of megafloods, from beneath the Ice Age Laurentide Ice Sheet shaped the Bahama Islands. These Mega-Floods traveled down the Mississippi River Valley and into the gulf of Mexico. These Megafloods entered the Gulf, rapidly raising the water level and forcing the overflow out through the much smaller Florida/Cuba Straits. This Glacial overflow then spread across the lower lying area known as the Bahama Mega-Bank. 12,000yrs. ago, (with sea levels at least 300 ft. lower than today) the Bahama Mega-Bank was an exposed land mass larger than present day Florida. Sea ice in the Arctic has failed to re-form for the second consecutive winter, raising fears that global warming may have tipped the polar regions in to irreversible climate change far sooner than predicted. Although sea levels are not affected by melting sea ice - which floats on the ocean - the Arctic ice cover is thought to be a key moderator of the northern hemisphere's climate. It helps to stabilise the massive land glaciers and ice sheets of Greenland which have the capacity to raise sea levels dramatically. An international commission predicts that there is a high likelihood that all of the Himalayan glaciers will melt by 2035. The Himalaya will turn black, and the Ganges and other rivers that flow from it will dry to seasonal streams. The 500 million people in India who depend on water from these rivers will have no other source. As mountain glaciers and snow packs melt everywhere, China, the Andes and California will face the same climate shock - no water. WARM-UP IN THE ALPS It is not only the glaciers themselves that are warming, but the rock and soil beneath the surface as well. Scientists have discovered that Europe's permafrost, the frozen earth covering mountain areas like the Alps, is melting. Underground temperatures have risen by nearly a degree in the past decade - three times faster than at any other time in the last century. The rapid rotation of the Earth's inner core, as shown if Figure 10 and its continued motion could be readjusting thermal chimneys or even generating the release of thermal energy by that rotation itself. Evidence of global warming could be from this energy release. The oceans could likewise be warmed, producing dramatic climate changes. Glacial surges can be anticipated. Greenland could be as warm by 2100 as it was 130,000 years ago, when melting ice raised sea levels by 3-4m. Some of Greenland's glaciers, which are as large as Manhattan and as tall as the Empire State Building, can move 10m in less than a minute, according to Harvard University scientists. This jolt is sufficient to generate seismic waves. The range of rise this century had been predicted to be 20 to 60 centimetres, but would be the upper end of this range at a minimum and some now believed it could be two metres. This would have catastrophic effects for European and US coastlines. He said newly invented ice penetrating radar showed that the melt water was pouring through to the bottom of the glacier creating a melt water lake 500 metres deep causing the glacier "to float on land. "These melt water rivers are lubricating the glacier, like applying oil to a surface and causing it to slide into the sea. It is causing a massive acceleration which could be catastrophic." The ice core showed the Northern Hemisphere briefly emerged from the last ice age some 14,700 years ago with a 22-degree-Fahrenheit spike in just 50 years, then plunged back into icy conditions before abruptly warming again about 11,700 years ago. Melting permafrost has damaged hundreds of buildings, railway lines, airport runways and gas pipelines in Russia, according to the 2004 Arctic Climate Impact Assessment commissioned by the Arctic Council, an intergovernmental body. In 1967, satellite imagery measured it moving 4.3 miles per year. In 2003, the rate was 8.1 miles. Scientists have been monitoring what they say may be the fastest moving glacier on the planet. The observed recent increase in summer surface melting on the Greenland Ice Sheet is producing large quantities of liquid water which, if it percolates down to the base of the glacier, can lubricate its flow over rocks towards the ocean. Maybe Earth is warming from the inside. Just four years ago the UN's Intergovernmental Panel on Climate Change predicted that Antarctica would not contribute significantly to sea level rise in the 21st century. But glaciologists meeting at the Royal Society in London this week argued that the continent could already be the principal cause of rising sea levels. The edges of the Antarctic ice sheets are crumbling at an unprecedented rate, says Andy Shepherd of the University of Cambridge. In one area, around the Amundsen Sea in West Antarctica, the Pine Island and Thwaites glaciers are dumping more than 110 cubic kilometres of ice each year. Warmer ocean waters circulating beneath the two glaciers are melting their bases and triggering an ever-faster slide into the ocean. Harris and Chapman examined temperature data from boreholes throughout the Northern Hemisphere, which helps eliminate regional anomalies in their findings. They estimate that the Earth has warmed 1.1 degrees C. over the past 500 years - more than double the 0.4- to 0.5-degree estimates suggested by most tree-ring analysis. In their article, they say the difference may be that tree-ring analysis primarily reflects temperatures when trees are actively growing during the warm season, but doesn't reflect changes in winter temperatures. Much of the annual warming recorded by instruments over the past 100 years has occurred during the winter season, they add. Now scientists say it is vanishing far faster than even they expected. Its complete disappearance would raise the levels of the world's seas by 20 feet, spelling inundation for London and other coastal cities around the globe, along with much of low-lying countries such as Bangladesh. Researchers using satellite data say that plant life above 40 degrees north latitude has been growing more vigorously since 1981. The growing season in Eurasia is now almost 18 days longer than before with spring arriving a week early and autumn delayed by 10 days. The growing season in North America appears to be as much as 12 days longer. This research will appear in the Journal of Geophysical Research. Perhaps this is more due to the Earth warming from within than atmospheric induced global warming. THE earth may be more resilient in the face of global warming than originally thought, according to scientists who believe the world is getting wetter as it warms, enhancing the biosphere's ability to soak up carbon dioxide. Research from Australian scientists released during the annual science meeting of the Co- operative Research Centre for Greenhouse Accounting, supports the notion that the earth is self-regulating. THE GREENLAND ICE SHEET IS MELTING! Melt rates of this area are indicative of geothermal fluxes 15 to 30 times greater than the continental background rate. And if a natural volcano can't bring about the demise of the Greenland Ice Sheet, it's very likely the human volcano won't either. Another U.S. study suggests it will soon be the Antarctic's turn. While the climate there has been cooling for 30 years, the trend is likely to rapidly reverse, researchers from NASA's Godard Institute of Space Studies concluded. Measurements over the past three decades show these are among the fastest- warming places on earth, with winter temperatures already 5C higher than in 1974. Many glaciers and ice-sheets are melting. "What we are seeing now is dense swards or lawns forming and both plants growing much further south than ever before. It is quite remarkable." King and his colleagues believe such trends could continue, possibly even raising winter temperatures on the peninsula from their past average of -10C to near freezing. Eventually this could give the peninsula a climate comparable to that of Scandinavia. The energy from that 60o rotation of the Earth's core in 1970 has to go somewhere. If the Earth's interior is increasing in temperature due to the jerk like rotation of its inner core by 60o in 1970, that heat may be first felt at the thinnest part of the Earth's crust which is at the bottom of the oceans. These will cause biological changes in Earth's oceans. "Right now, anywhere we go from shore to 20 miles offshore, from Sarasota to Tarpon Springs, we can't find a single creature alive on the bottom right now," said Miller. Miller says he's never seen such death and devastation under water in his 20 years of diving. BE PREPARED: SUDDEN SHIFTS IN CLIMATE COMING Embedded in ancient tree rings and ice cores are signs that quick, drastic change is a fundamental characteristic of Earth's climate. In a sense, humanity has been living in the meteorological equivalent of a fool's paradise. Agriculture and other aspects of civilization have developed during a period of relatively benign climate. Comet strikes cause rapid climate change. CYCLICAL ICE AGE GETS HOLD OF THE EARTH ?how severe will it be by 2012? With our current technology, our civilization will survive the smaller cycle ? the 11,000 year cycle that can produce a mini ice age. Food will be scarce and much of the northern hemisphere will be under deep ice with little life there. Serious migration of population will take place from north to south. "The earth is now on the brink of entering another Ice Age, according to a large and compelling body of evidence from within the field of climate science." Rising concentrations of greenhouse gases may have more serious impacts than previously believed, a major scientific report has said. A huge European project to capture greenhouse gases and store them underground is to be piloted this week aiming to slash Europe's output of harmful carbon dioxide by 10%. Before 1998, Earth's equatorial bulge in the gravity field was getting smaller because of the post-glacial rebound, or PGR, that occurred as a result of the melting of the ice sheets after the last Ice Age. Currently, the Earth has a significant upward bulge at the equator, and a downward bulge at the poles. "Observations of the Earth's gravity field show that some phenomena are counteracting the gravitational effects of PGR. Satellite measurements show that the globe's 25,600-mile circumference has grown about a quarter of an inch since 1998. Things getting hotter (even from the inside) expand! DOES THE EARTH CHANGE ITS SHAPE? A great weakening in the Earth's magnetic field has been discovered to have occurred 3500 to 3000 BC. See this related web site's first figure. This weakening correlates with Vulcan's last aphelion 5,000 years ago. RED PLANET WARMING High-resolution images snapped by NASA's Mars Global Surveyor show that levels of frozen water and carbon dioxide at the Red Planet's poles have dwindled dramatically over a single Martian year. Mars, like Earth, is warming from the inside due to a shift of its primordial black hole core as Vulcan passed aphelion circa 1970. In the last 14 years, one or more changes have occurred. "Pluto's atmosphere is undergoing global cooling, while other data indicates that the surface seems to be getting slightly warmer. Eris is now near its farthest point from the Sun, so it is expected to be cold and inactive. But a new study suggests the dwarf planet's surface may have changed in the last few years. So there is Global Warming on at least 4 other bodies in our Solar System that co-insides with the recent warming on Earth. Doesn’t this point strongly towards the Sun or some other Cosmic force as the cause? Or has Vulcan passing aphelion influenced the core related heating of all the solar planets? THE WHOLE SOLAR SYSTEM IS UNDERGOING GLOBAL WARMING. Sunspot 484, which first appeared this past weekend, has grown into one of the biggest sunspots in years. Now about the size of the planet Jupiter, it's easy to see. Meanwhile, say forecasters, another big sunspot could soon appear near the Sun's southeastern limb. The Sun is more active now than it has been for a millennium. The realisation, which comes from a reconstruction of sunspots stretching back 1150 years, comes just as the Sun has thrown a tantrum. Sunspots have been more common in the past seven decades than at any time in the last 8,000 years, according to a new historic reconstruction of solar activity. Cosmic rays constantly bombard Earth's atmosphere. Chemical interactions create a fairly constant source of stuff called carbon-14, which falls to Earth and is absorbed and retained by trees. But charged particles hurled at Earth by active sunspots deflect cosmic rays. So when the Sun gets wild, trees record less carbon-14. They then extrapolated the tree ring data backwards in time and discovered that no period in the last 8000 years has been as active as the last 70. About 75 sunspots have appeared every year in this period, compared to an annual average of about 30 over the last 11,400 years. Red and green lights dance in the sky above the North and South poles. The two lights - the Aurora Borealis and Aurora Australis - appear to be a mirror image of each other. DOES THE AURORA BOREALIS FORECAST WAR IN THE UNITED STATES? The shifting core of the Earth may cause mass astrological affects on mankind which induce war. See Fig10. Rapid Rotation of the Earth's Inner Core The thesis proposed above is not necessarily unreasonable. World War II followed a great Aurora Borealis . . . A great aurora borealis illuminated the skies of the world on January 25, 1938. Shortly after, World War II began. This was the great sign foretold by the Virgin Mary to the children at Fatima on July 13, 1917. "Bulletin of the Astronomical Society of France," 1938, pp. 43-68; pp. 113-125; pp. 306-310: "The first impression was of a gigantic conflagration..."
September 11, 2001 - terrorism brings war to America. November 6, 2001 - A rare sighting in Ohio of the aurora borealis prompted a flurry of phone calls from concerned citizens to National Weather Service offices. Southerly Ramona, California (at 33 o latitude, in the beautiful foothills east of San Diego)--I never thought I'd see the Aurora Borealis, but there it is. North of Atlanta, Ga in Gainesville, GA. Took a look outside and to my surprise I saw the northern lights. I'm in the Northeast Heights of Albuquerque(35 o north latitude) and the sky is a deep, crimson red north of the city. Summary : - Evidence exists that the poles have changed position during the past ages. This possibility, however, so far has been disregarded on the basis that such a phenomenon is thought to be physically impossible. The following article shows the possibility of very rapid shifts of the poles due to the impact of astronomical objects as small as a half-kilometer diameter asteroid. Based on what [Tollmanns] claim to have found in the historical record, and comparing that with modern calculations of the consequence of a major collision, they conjure up the following picture of events. Immediately following a series of impacts, there was a great heat pulse produced by the fireballs. As a result of flood and fire, much of the world was left in ruins. Many of the ancient stories also tell of earthquakes of enormous magnitude. "The crust moved, according to these traditions, like the running high waves of the tempestuous sea, hurtled people on their faces, uprooted trees, crushed rocks, broke down mountain crests and raised them elsewhere, changed the landscape and submerged many islands in the Atlantic and in the Indian Ocean. Wildfires are reported in tales from Indians in California, and similar stories from the Near East around the Euphrates." The thing is burned on my retina," said Habecker, a ranger at Denali National Park and an astronomy buff. The light that blazed at about 10:20 p.m. Friday "was the biggest thing I've ever seen in the night sky." "You could feel it traveling through the house," said Candice Bales, a lawyer who lives in Palmer and felt the boom but never saw the light. "It came from the Sutton area, as fast as it traveled through the house. We felt it with our feet." Enough people called authorities Friday night to express concern that state troopers took a helicopter up to Mount McKinley the next day to search for a possible area of impact. The flight Saturday arose partly out of a confusion with another real event - an earthquake that struck the McKinley area about 50 minutes after the flash-boom. The small temblor, registering 2.5 on the Richter scale, occurred at 11:14 p.m. Friday and was centered 45 miles northwest of Talkeetna, said geophysicistBruce Turner with the Tsunami Warning Center in Palmer. Compare this to the possibility of a comet fragment, impacting in or detonating above water, could be responsible for the 7.4 magnitude Turkish earthquake of 08/17/1999 without leaving an impact crater. However, such a strike could be the fulfillment of a Nostradamus prophecy. See section 4W Tunguska and other Recent Strikes. IMPENDING EARTHQUAKES TO HIT NEW YORK AND CALIFORNIA. Is this the prelude to the big one? SCIENTISTS OBSERVE RARE CONTINENTAL RIFT PROCESS IN ETHIOPIA The volcanic activity, recorded at N 12.651 degrees longitude and E 40.519 degrees latitude, spewed ash for three continuous days and eventually numerous cracks appeared in the ground, spreading fear among the pastoralist inhabitants. 07-18-98 A series of 14 quakes will strike Japan with the 7.2 quake that hit Osaka being the 7th one. One of the next 4 will be an 8.9 Osaka quake. The 13 th quake will be a 9.6 quake that will strike Tokyo. The 14 th will be a small one. 07-18-98 Los Angeles going to be hit with a 8.9 quake originating in the San Gabriel Mountains as the plate on the other side of the Pacific moves. A series of 15 quakes in the California area will cause a mass exodus. 12-03-94 San Diego, San Bernardino, North Bakersfield, Barstow: all are fracture points. Hollister, Palo Alto, Imperial, Ukiah, Eureka, Point Mendocino, Monterrey, Offshore San Luis Obispo, Capistrano, Carmel: these are all stress points of fracture in sequence. "Time" is indefinite. Expect gradual destruction of the California economy as people begin mass exodus. Also, Shasta erupts; Lassen activity. Ocean floor begins to subside. Seismologists alarmed by rash of quakes rattling around globe. new data from Nasa's two Grace (Gravity Recovery and Climate Experiment) satellites reveals that the 9.1 magnitude quake raised the seafloor in the region by several metres for thousands of square miles. They noticed a region beneath Asia where seismic waves appeared to dampen, or "attenuate," and also slow down slightly. "Water slows the speed of waves a little," Wysession explained. "Lots of damping and a little slowing match the predictions for water very well." Although they appear solid, the composition of some ocean floor rocks is up to 15 percent water. "The water molecules are actually stuck in the mineral structure of the rock," Wysession explained. "As you heat this up, it eventually dehydrates. It's like taking clay and firing it to get all the water out." The researchers estimate that up to 0.1 percent of the rock sinking down into the Earth's mantle in that part of the world is water, which works out to about an Arctic Ocean's worth of water. Wysession has dubbed the new underground feature the "Beijing anomaly," because seismic wave attenuation was found to be highest beneath the Chinese capital city. Wysession first used the moniker during a presentation of his work at the University of Beijing. Water covers 70 percent of Earth's surface and one of its many functions is to act like a lubricant for the movement of continental plates. "Look at our sister planet, Venus," Wysession said. "It is very hot and dry inside Venus, and Venus has no plate tectonics. All the water probably boiled off, and without water, there are no plates. The system is locked up, like a rusty Tin Man with no oil." Showing us 101 'events' of crop loss across the planet as of this current moment, as we reported on ANP back on May 9th, according to industry insiders, food prices were expected to skyrocket partially due to the extremely cold and very long winter experienced by huge parts of the US. Making it difficult to impossible for some farmers to even get their crops into the ground, as we'd asked in this April 17th ANP story, is full-scale weather warfare inducing global famine? During the last ice age, some big changes in Amoc led to winter temperatures changing by 5-10C in as short a time as one to three years, with major consequences for the weather over the land masses bordering the Atlantic. "The [current] climate models don’t predict [an Amoc shutdown] is going to happen in the future – the problem is how certain are we it is not going to happen? It is one of these tipping points that is relatively low probability, but high impact." At around 2040-2050 we will be in a new major Solar Minimum. It is to be expected that we will then have a new “Little Ice Age” over the Arctic and NW Europe. The past Solar Minima were linked to a general speeding-up of the Earth’s rate of rotation. This affected the surface currents and southward penetration of Arctic water in the North Atlantic causing “Little Ice Ages” over northwestern Europe and the Arctic. we will be experiencing a cold period similar to the “Little Ice Age” that enveloped the world between about 1550 AD and 1850 AD. During that time, global temperatures were up to 2 degrees F colder than now and that chill had a significant effect on food production. Some of the Earth's tiniest naturally occurring particles may have just bred a big mess for climatologists. New findings reveal that models scientists have long used to estimate the causes and effects of global warming may be dramatically flawed due to errors in one of their most important inputs. And the Akkadian king knew about Vulcan via the Akkadian Seal. 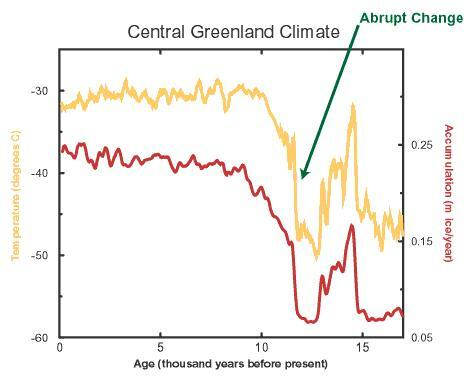 Central Greenland's temperatures over the most recent 17,000 years. The Younger Dryas event as an example of abrupt climate change. ABRUPT CLIMATE CHANGES OF THE LAST DEGLACIATION DETECTED IN A WESTERN MEDITERRANEAN FOREST RECORD Multi-centennial-scale oscillations in forest development occurred throughout the BA, YD, and early Holocene. Shifts in vegetation composition and (Pann reconstructions indicate that forest declines occurred during dry, and generally cool, episodes centred at 14.0, 13.3, 12.9, 11.8, 10.7, 10.1, 9.2, 8.3 and 7.4 cal ka BP. The forest record also suggests multiple, low-amplitude Preboreal (PB) climate oscillations, and a marked increase in moisture availability for forest development at the end of the PB at 10.6 cal ka BP. Dry atmospheric conditions in the Western Mediterranean occurred in phase with Lateglacial events of high-latitude cooling including GI-1d (Older Dryas), GI-1b (Intra- Allerød Cold Period) and GS-1 (YD), and during Holocene events associated with high-latitude cooling, meltwater pulses and N. Atlantic ice-rafting. One of the more interesting results from recent research into climate is that for the past million years or so, the earth’s climate has shown a distinct 100,000 cycle of long ice ages punctuated by a brief, warm intergalacials. We are in one of those brief warm periods, an interglacial period that is called the Holocene. Temperatures over the most recent 420,000 years of earth’s history. The zero line is just a handy reference point, it has nothing to do with the freezing point of water. As you can see climate changes by about 14 degrees C from the top of the interglacial to the bottom of the ice age, but even the 420,000 or so years covered by the Vostok cores is just a moment in earth’s geological history. As noted, the 100,000 year cycle has been a feature of climate for about a million years. For two million years before that the cycle was the same except that it was 40,000 years long and temperatures were warmer. The whole three million years, in turn, is part of an ice age phase of the earth in which temperatures have generally been falling. There have also been hot house phases. Scientists have no real idea why the earth has been cooling over the past three million years and, in particular, are puzzled over the shift from 40,000 to 100,000 cycles. 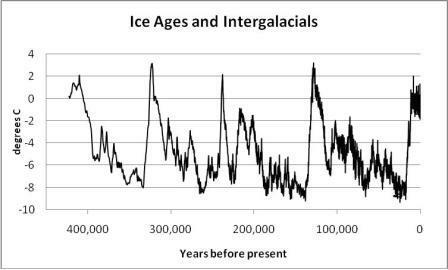 As you can see from the graph the Holocene is already longer than the preceding three interglacial periods at least. Estimating from graphs that are better than mine, the Eemian lasted less than 10,000 years and the previous two interglacials lasted perhaps just 5,000 years. The Holocene, in contrast, has clocked up 10,000 years plus. Further, those 10,000 years have remained comparatively warm, in contrast to the previous interglacials in which temperatures spiked then fell away again very quickly. In all cases the final collapse into an ice age has been abrupt - perhaps just a few generations. The atmosphere-oceanic system just seems to trip over itself to fall 10 degrees and more, and with climate theory in its present state there is no way to predict when it will occur. "We will now have to re-think our theories on how people migrated to northern Sweden and northern Norway, said Ostlund. "They didn't get here from the south via the coasts, the finds in Kaunisvaara make this very clear," he added. Fears that a shutdown of ocean currents is about to plunge Europe into a mini ice age have receded. Unless there is a comet-Earth impact of course. The five factors that Diamond believes drive societal failure are: hostile neighbors, loss of trading partners, environmental damage, climatic change, and how societies respond to these potentially devastating environmental problems. 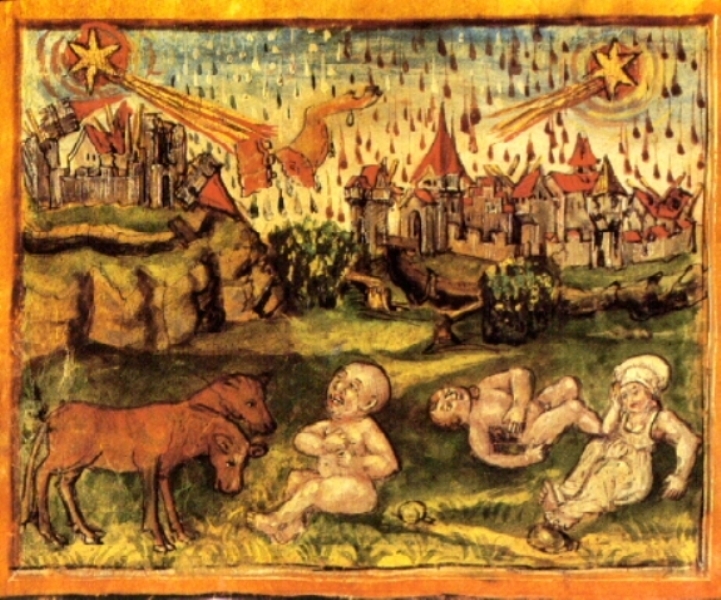 Noah's flood (caused by a comet impact) occurred near 3195 BC, just over 5000 years ago. One of the most shocking scientific realizations of all time has slowly been dawning on us: the earth's climate does great flip-flops every few thousand years, and with breathtaking speed. We could go back to ice-age temperatures within a decade ?and judging from recent discoveries, an abrupt cooling could be triggered by our current global-warming trend. Europe's climate could become more like Siberia's. It is unlikely humans exterminated the immense marsupial Diprotodon and other huge beasts that once roamed Australia in a short killing spree. Two new studies reject the theory that humans moving on to the continent more than 45,000 years ago took out its megafauna in a 1,000-year "blitzkrieg". The studies suggest instead a more complex pattern to the extinctions. Their authors say humans certainly had a role but it was not as important as the period's climate changes. "There is not a single stone-spear-point in Australia until, at the very earliest, about 15,000 years ago - long after anyone thinks the megafauna went extinct," said co-author Dr Stephen Wroe, from the University of Sydney. "You try taking out a two-to-three-tonne wombat with a pointy stick. "I don't doubt the first Aboriginals did hunt megafauna but the argument that they did it with the efficiency required to effect near-instantaneous extinction is not, in my view, credible." Ice cores taken from mountains as far apart as the Andes in South America and the Himalayas in Asia have revealed how climate change is leading to a full- scale retreat of the world's tropical glaciers. Because the Earth is oriented in space in such a way that the hemispheres are out of phase in terms of the amount of solar radiation they receive, it is surprising to find that the climate in the Southern Hemisphere cooled off repeatedly during a period when it received its largest dose of solar radiation," says Singer. "Moreover, this rapid synchronization of atmospheric temperature between the polar hemispheres appears to have occurred during both of the last major ice ages that gripped the Earth. Very soon, however, heterodox thinkers such as the Cambridge astronomer Sir Fred Hoyle began to put other pieces of the puzzle together. Having already dispensed with Milankovich Earth axis tilt thesis as well as another of his own invention, Hoyle proposed that major meteor strikes were the cause of the great glaciations that have occurred in the last million years or so in a book entitled Ice. Having dispensed with Uniformatarianism Hoyle was informed enough to see that the Darwinian thesis for evolution was also out of date. Something had to be done according to Hoyle. Hoyle's theories are cited only at professional risk. His theories on the Ice Age are ignored. Humanity's most common Chief Feature is Stubbornness. Only within the past decade have researchers warmed to the possibility of abrupt shifts in Earth's climate. Sometimes, it takes a while to see what one is not prepared to look for. Giant comets thrown into short-period, Earth-crossing orbits are a major source of mass flux into the inner planetary system. Their disintegration products may give rise to climatic cycles, ice epochs, periodic mass extinctions and other global disturbances. Comets greater than or similar to 100 kilometres in diameter, in chaotic orbits beyond Jupiter, probably constitute a more substantial current hazard than stray asteroids. Professors Fred Hoyle and Chandra Wickramasinghe claim attempts to counter global warming are misguided. Writing in the Astrophysics and Space Science Journal, they believe the Earth broke free of the grip of the Ice Ages after it was struck by a comet 10,000 years ago. As late as 1975 the editor of New Scientist was warning that 'the threat of a new ice age must now stand alongside nuclear war as a likely source of wholesale death and misery for mankind'. If anything, it is the risk of an ice age which we have to fear. When ice ages arrive, the geological record tells us, they arrive quickly, within the space of a few years. A repeat of the last ice age would see the ice caps extending to the Thames. England would become like Greenland: capable of supporting marginal settlements on its southernmost fringes, but a wasteland within. What is more, the geological record shows that ice ages have tended to occur at 10,000-year intervals and are preceded by few warning signs. The last ice age ended 10,000 years ago. According to the researchers, the powerful ocean current which transports warm water to Britain and northern Europe has weakened dramatically in recent years because of the global warming. As a result, the inhabitants of these regions are likely to experience harsher winters and cooler summers. "Models show that if it shuts down completely, 20 years later, the temperature is 4C to 6C degrees cooler over the UK and north-western Europe,"
The coldest period will occur 15 to 20 years after a major solar output decline between 2035 and 2045, Abdusamatov said. A Russian astronomer, Khabibullo Abdusamatov of the Pulkovo Astronomic Observatory in St. Petersburg, reported on Monday that the global warming experienced in the 20th century was mainly caused by an increased solar activity. According to him, this increased solar activity will reach its peak in six of seven years from now, after which the temperatures will start to drop. Abdusamatov said there will be a massive solar output decline between around 2035 and 2045 which will correspond to a mini Ice Age on Earth. According to the World's Meteorological Organization (WMO), there soon might be an unprecedented amount of catastrophic weather anomalies on the Earth. At any time after 2010, their research suggests, Britain's average temperature could drop by up to 5C within as little as three or four years - with catastrophic results for farming, transport, northern towns and tourism. MANY SCIENTISTS NOW BELIEVE THAT RAPIDLY INCREASING CO2 EMISSIONS WILL EXACERBATE THE NATURAL CYCLE. MOSS LANDING, California -- A remarkable expedition to the waters of Antarctica reveals that iron supply to the Southern Ocean may have controlled Earth's climate during past ice ages. Metallic meteorites contain high concentrations of iron. Perhaps an alternative explanation for the theorized iron rich dust supposedly responsible for the large phytoplankton growth is dust from meteorite and comet impacts that periodically bombard the earth, coinciding with the onset of ice ages. These latest findings add to recent studies that showed the Pleistocene-Holocene transition to have transpired within a brief span of 50 years or so, thus casting more doubt on the traditional Milankovitch-theory of gradual climate chance. Major climatic events during past global ice ages did not occur at once or with the same intensity everywhere, according to new data. The research shows that Mongolian glacier advances during the last ice age were not synchronised with alpine glaciers in Europe and North America, suggesting that climate varied significantly between continents. David Fink, Leader of ANSTO’s Cosmogenic climate Archives of the Southern Hemisphere (CcASH) project, said ANSTO has refined a dating technique which measures nuclear signals or ‘cosmogenic radioisotopes? produced in rock surfaces when they are freshly exposed. This technique can accurately date the time glaciers advance and retreat. A study of past climate changes in the South American tropics has challenged traditional understanding of the mechanisms that triggered the advance and retreat of glaciers during the last ice age. The National Science Foundation (NSF) funded study was published in this week's issue of Science. A research team found that glaciers in the tropical Andes Mountains retreated several thousand years earlier than North American glaciers during a period of wet climate conditions, and during a time when the sun's warming radiation (solar insolation) was at a minimum. The finding contradicts traditional thinking that climate conditions in the northern latitudes generate the advance and retreat of global glaciation, and that glaciers retreated during dry climate conditions and when solar insolation was at its maximum, said lead researcher Geoffrey Seltzer of Syracuse University. "If the tropics warmed earlier than the northern latitudes, as our study demonstrates, that means there is something else influencing climate change that we don't yet understand." The precursor of modern animals may have been able to survive a Snowball Earth era that occurred some 600 million years ago because of a belt of open water along the equator, suggests scientists from the University of Toronto and Texas A&M University. This was a time considered critical in the evolutionary development of multi-celled animals and therefore the most important interval for biological evolution in general. Dr Moore bases his assertion on two arguments. Firstly, he points out that the two periods in human history that were warmer than today were not characterised by economic and social stagnation. On the contrary, mankind flourished. Secondly, he contends that higher carbon-dioxide emissions, coupled with warmer autumns and winters, would boost agricultural production, reduce burdensome heating costs, improve transportation and cut fatalities. Satellite data show plant growth has been measurably more vigorous over the last 25 years. The Antarctic Peninsula is one of three points on the globe that is warming particularly quickly at the moment. Climate had always changed. But the change now was particularly rapid and could trigger unexpected events, he warned. Did the influx of freshwater 8,200 years ago from large lakes in what is now northern Canada help trigger the coldest climate event in the Earth's climate system in the past 10,000 years? Yet the record preserved in cores drilled out of the Greenland icecap shows climate change can be very rapid indeed, flipping from one stable state to another in a few decades. Scientists based at the Institute for Astronomy in Zurich used ice cores from Greenland to construct a picture of our star's activity in the past. They say that over the last century the number of sunspots rose at the same time that the Earth's climate became steadily warmer. In particular, it has been noted that between about 1645 and 1715, few sunspots were seen on the Sun's surface. This period is called the Maunder Minimum after the English astronomer who studied it. But the most striking feature, he says, is that looking at the past 1,150 years the Sun has never been as active as it has been during the past 60 years. Over the past few hundred years, there has been a steady increase in the numbers of sunspots, a trend that has accelerated in the past century, just at the time when the Earth has been getting warmer. The data suggests that changing solar activity is influencing in some way the global climate causing the world to get warmer. Over the past 20 years, however, the number of sunspots has remained roughly constant, yet the average temperature of the Earth has continued to increase. "The renewal of ice-age conditions would render a large fraction of the world's major food-growing areas inoperable, and so would inevitably lead to the extinction of most of the present human population. Since bolide impacts cannot be called up to order, we must look to a sustained greenhouse effect to maintain the present advantageous world climate. This implies the ability to inject effective greenhouse gases into the atmosphere, the opposite of what environmentalists are erroneously advocating." During the ice-ages the whole Earth was cooled, including the tropics. This is proved by glaciers extending down to about 10,000 feet on tropical mountains, mountains which at present do not hold glaciers, such as the mountains on the island of Hawaii. Now researchers have evidence suggesting that an asteroid roughly 200 yards (183 meters) wide crashed off the coast of New Jersey and sent tsunamis surging toward what is now New York City some 2,300 years ago. "Our models suggest the tsunamis were up to 20 meters (66 feet) high when they entered the Hudson River," said researcher Dallas Abbott, a geologist at Columbia University's Lamont-Doherty Earth Observatory in New York. New York City lies at the mouth of the Hudson. When the scientists drilled out tubes of sediment from the New York and New Jersey area, they discovered layers of unusual debris that, they suggest, were laid down by tsunamis. "We have layers up to maybe 30 centimeters (11.8 inches) thick," Abbott said. "They get thinner upriver, where they're more like 6 centimeters (2.3 inches) thick." Most evaluations of the risks of asteroid or comet impacts state that there is little danger associated with those many cases where the object explodes in the air and never reaches the ground (Chapman and Morrison 1994). There is only significant global risk in those rare cases where a large object hits the surface - less than once per 100,000 years. However, the experience of the last 100,000 years has been a large number of climate excursions overlapped by the beginning and end of an ice age. The ice age climate excursions occurred about every 3,000 years with differences in mean temperatures of up to 7 degrees centigrade (Dansgaard et al 1993). Climate excursions on a smaller scale have also characterized the latest 6,000 years. This has been shown by decade long, worldwide narrowing of tree rings (Baillie 1995, 1999). Baillie has described at least 6 well dated episodes: 540 AD, 44 BC, 207 BC, 1159 BC, 1628 BC and 2345 BC. Only the episode 1628 BC can be explained by volcanism: the explosion of Santorini north of Crete destroying the minoan civilization. The AD 540 event lasting from 536-545 is best described in the historical records; it involved reduced sunlight, mists or "dry" fogs, crop failures, famines in China and the Mediterranean, and plagues. The impact of comet Shoemaker-Levy on Jupiter was a series of high airbursts resulting in huge plumes covering tens of thousands of km squared. The plumes were extremely black ("gunk"), they were visible for months and the particle haze in the Jupiter atmosphere has remained for years (Friedson et al 1999). While we spend time, money and effort on battling climate change, a very real threat is being virtually ignored. So horrendous is the calamity that some even dare wonder if the enormous investment in fending off climate change might not have been better spent. During the last 10,000 years climate has been seesawing between the North and South Atlantic Oceans. As revealed by findings presented by Quaternary scientists at Lund University, Sweden, cold periods in the north have corresponded to warmth in the south and vice verse. These results imply that Europe may face a slightly cooler future than predicted by IPCC, the Intergovernmental Panel on Climate Change. CHINA SEES CLIMATE IMPACTS AHEAD Me too! Climate change will bring major impacts to several regions of China, according to a major report from its government. The National Climate Change Assessment Report sees higher temperatures causing droughts, spreading deserts and reducing water supplies. Washington, Sept 11 : A global catastrophe brought about by a meteorite strike would equally affect marine life forms living two miles below the sea, as on land, according to a new study by a researcher from the University of Southampton. Palaeontologists have long puzzled over fossil records that, remarkably, suggest mammal species tend to last around two and a half million years before becoming extinct. They found that rodent species bit the dust in two regular waves. One wave of extinction was roughly every 2.4 million years or so and the other was about every million years or so, coinciding with extremes in the cycles of ellipticality, wobble and tilt. These were not swift, massive die-outs of the kind that famously wiped out the dinosaurs 65 million years ago, but rather a fadeout of species which could not cope with habitat loss or competition, especially when Ice Ages kicked in. Astronomical impact "provides a crucial missing piece in the puzzle" of regular species turnover, it says. Previous research has also established that Earth's climate system can be affected by massive volcanic eruptions or the impact of an asteroid or comet. These can kick up so much dust that the planet receives less sunlight, and in turn plant species suffer. FIRST CIVILIZATIONS WIPED OUT . . . IT COULD HAPPEN AGAIN! Throughout the world, there are a dozen impact craters that formed within the past 10,000 years. Two large ones formed in Argentina within the past 5,000 years. Because of the extent of the oceans, it is reasonable to believe that for every crater found on the ground there are several under water. Sturdy shoes first came into widespread use between 40,000 and 26,000 years ago, according to a US scientist. These sites share certain basic characteristics, including large-scale monumental architecture, extensive residential architecture and a lack of ceramics. The 95 new dates confirm the emergence and development of a major cultural complex in this region during the Late Archaic period between 3000 and 1800 calibrated calendar years BC. Even if the nuclei are more than .002 AU from Earth this could still be substantial enough to alter the climate. Probably, tree ring chronologies and ice cores could offer more definitive proof, although the confusion with volcanism is a substantial detraction. But then, how many volcanoes were impact related? An object of about 304.8 metres would flatten everything in an area the size of a state and kill everybody there. The planetwide effects of such a catastrophe are unknown, but debris thrown into the atmosphere can diminish sunlight and affect agriculture for months. A meteor strike that killed most of the population in a month would not be as serious as an abrupt cooling that eventually killed just as many. With the population crash spread out over a decade, there would be ample opportunity for civilization's institutions to be torn apart and for hatreds to build, as armies tried to grab remaining resources simply to feed the people in their own countries. The effects of an abrupt cold last for centuries. They might not be the end of Homo sapiens - written knowledge and elementary education might well endure - but the world after such a population crash would certainly be full of despotic governments that hated their neighbors because of recent atrocities. Recovery would be very slow. Many are already aware that our species is under siege from comets, super volcanoes, mega tsunamis and not the least of all, ourselves. We shouldn't be surprised about this. After all, we already know that our planet's history is rife with species ending disasters. Otherwise we would all be dinosaurs. In a universe full with black holes, comets, supernovae, predatory virus, and runaway planetary forces, few civilizations survive long enough to develop technologies to harness the cosmic and planetary forces that will ultimately snuff them out. Therefore, I would add to your thesis some relevant ideas about human evolution and expand your concept of sudden cosmic catastrophism to evolution in general. There seems no reason to not believe that there were at least 20 globally devastating cosmic catastrophes during the last 5 million years. The impacts surely caused significant climate downturns, reduction in the ozone layer, severe acid rain, and the global distribution of toxins. However, these catastrophes should not always be looked on as evolutionarily detrimental. In fact, providing the devastations didn't wipe out all life or severely restrict it, the catastrophes probably propelled our ancestors to adapt genetically and socially to the changing environment. Episodes of cometary or asteroidal impacts punctuate natural as well as human and societal evolution and should thus be looked upon as natural agencies determining evolutionary regressions, extinctions, macro-mutations, and also in some instances evolutionary progress. Most considerations on this have been done by physical scientists using physical considerations. I believe that the normally-quoted value is an object 1-2 km in size, which would cause a 'global catastrophe,' the limiting effect being the production of oxides of nitrogen in the blast and hence poisoning of the atmosphere (i.e., there are other deleterious effects, but this seems to be the major one, the one which sets the limit on the impactor size). In my view, though, the present western civilization with its intricate economic links would be unlikely to survive unscathed the aftermath of a 100-200 metre object arriving either: (a) Over Central/Western Europe; (b) Over either the NE or the West Coast of the USA; or (c) Over the Atlantic or Pacific but close enough to populous coasts to cause megadeaths. Nostradamus's 7 strad meteorite is 474 meters in diameter or more. HUMAN RACE - THE PAST & THE FUTURE. Duncan Steel, an expert in comets and meteorites, who heads the space technology group at Salford University, said the threat from space was real. He added: "Life has existed on Earth for 3.8 billion years, but the course of evolution has been altered time and again by asteroid impacts. At last a species has evolved which has the ability to save itself and ensure its future. That species is us." Don't try this: Water drips away from a lump of burning methane ice taken from the ocean floor. ENVIRONMENTAL DAMAGE FROM ASTEROID AND COMET IMPACTS Michael Paine (mpaine@tpgi.com.au) Updated 23 May 2001. The origin of such a tsunami is also under debate. An undersea landslide is the most likely source, but one research group has proposed that an asteroid impact provided the trigger. "TSUNAMI WARNING" ??? TO EAST COAST RESIDENTS ??? Pandya said the Onge don't know that an earthquake triggered the tsunami. But knowing that the creek rises and falls with the tide, the Onge suspected that the extreme fall in the creek presaged a great flood. In their thinking, evil spirits cause floods by taking huge boulders out of the stars and throwing them at the sea. In a nutshell, Weissel and others said, land masses that poke abruptly from the deep ocean experience tsunamis as diffusely rising tides, while those bounded by shallower seas get hit by higher, steeper and often more destructive waves. At the core of this truth -- as with most truths in physics -- is an equation: v square root (g times h), where v is the wave's velocity, g is the force of gravity and h is the depth of the water. In plain English, as the water gets shallower, waves slow down. Small asteroids do not make great ocean waves that will devastate coastal areas for miles inland, according to both a recently released 1968 U.S. Naval Research report on explosion-generated tsunamis and terrestrial evidence. University of Arizona planetary scientist H. Jay Melosh is talking about it today at the 34th annual Lunar and Planetary Science Conference in League City, Texas. His talk, "Impact-Generated Tsunamis: an Over-Rated Hazard," is part of the session, "Poking Holes: Terrestrial Impacts." Thames Water, the country's largest water company, said it was imposing a hosepipe ban across London and the southeast because of severe drought. The reports said water depths in parts of the Straits of Malacca could have dropped from 4000 feet before the quake to as low as 100 feet. Giant tsunamis, super volcanoes and earthquakes could pose a greater threat than terrorism, scientists claim. Giant walls of water that can devastate coastal cities, volcanoes so big that their ash crushes houses 1,500km (932 miles) away, giant earthquakes and asteroid impacts. These are very rare events and, if we are lucky, nothing like them will happen in our lifetimes. The greatest danger to humanity comes from asteroids, but work funded largely by the US government is swiftly tackling this threat. The European Space Agency (ESA) and NASA are planning missions to test how the course of asteroids and comets can be altered by an impact. The bad news is tens of millions of people along the eastern seaboard of the United States and Canada may drown if the slow slippage of a volcano off north Africa becomes a cataclysmic collapse. But the good news is the world is not likely to be destroyed by an asteroid any time soon. I bet a comet strike would dramatically increase the chances of one flank of the Cumbre Vieja volcano slipping into the sea. One flank of the Cumbre Vieja volcano on the island of La Palma, in the Canaries, is unstable and could plunge into the ocean during the volcano's next eruption. Dr. Day says: "If the volcano collapsed in one block of almost 20 cubic kilometres of rock, weighing 500 billion tonnes - twice the size of the Isle of Wight - it would fall into water almost 4 miles deep and create an undersea wave 2000 feet tall. Within five minutes of the landslide, a dome of water about a mile high would form and then collapse, before the Mega Tsunami fanned out in every direction, travelling at speeds of up to 500 mph. A 330 ft wave would strike the western Sahara in less than an hour." VOLCANIC ERUPTION COULD UNLEASH GIANT TSUNAMIS ON U.S. Researchers have discovered that a chunk of volcano in the Canary Islands the size of the Isle of Man is on the brink of falling into the sea. Scientists believe it could break away when the Cumbre Vieja volcano in La Palma next erupts. If that happened a giant tsunami, or massive wave, reaching heights of more than 500 feet would be sent racing across the Atlantic at the speed of a passenger jet. Seven-tenths of a second after the impact of a 10-km diameter comet into the ocean, its explosive power would be the equivalent to 300 gigatons of TNT (far exceeding the explosive power of all the nuclear weapons in existence during the Cold War). The comet itself would be almost instantaneously vaporized, along with 300 - 500 cubic kilometers of water. As a result of the explosion, high pressure steam would rise into the atmosphere and would return to earth with unimaginable weather conditions. A rain storm would be a poor description of the results. The use of the term "flood gates of the heavens" as given in Genesis becomes a very good description. Global earthquakes with ground waves 10 m high would result. The earth's core would be disrupted, possibly producing magnetic reversals. Plate movement would be accelerated, opening cracks 10-100-km wide in the earth's crust, and causing rapid mountain-building and worldwide volcanism. Did hunters wipe out the American megafauna? Did climate change do it? Or was it a plague? In North America, this icy mantle prevented Arctic weather systems from extending into the mid-continent. Seasonal weather swings were less dramatic and didn't reach as far south as they presently do. But with this change, the climate became more similar to today's, marked by cold winters and warm summers. "We do know that human colonists caused extinctions in isolated, tightly bound island settings, but islands are fundamentally different from continents," he added. "The overkill hypothesis attempts to compare the incomparable and there is no evidence of human-caused environmental change in North America. But there is evidence of climate change. Overkill is bad science because it is immune to the empirical record." But the flu may have worse in store, according to scientists who claim to have discovered an alarming explanation for the epidemic - a virus from outer space. Dismissing as dogma the conventional medical wisdom that flu is a virus passed by human contact, the distinguished astrophysicist Sir Fred Hoyle, and his colleague at Cardiff university, Chandra Wickramasinghe, warn that we may be on the brink of a global epidemic. See Fig8A. Medieval Painting of the Impending Strike and notice the sick children. The virus believed to cause Severe Acute Respiratory Syndrome (Sars) may have come to Earth from outer space, according to scientists writing in a leading British medical journal. “Researchers have learned that the Earth’s biosphere extends to much higher altitudes than previously suspected,” says Wright, “up to 100,000 feet or more.” Indeed, thousands of microbial species have been found in the upper atmosphere, traveling up to thousands of kilometers. The best-studied “atmospheric bridge” is between North Africa and the Caribbean. The study, published in the June 2012 issue of Astrobiology, details how the lichen was exposed to (and survived) electromagnetic and cosmic radiation, a space vacuum and extreme temperatures during the European Space Agency's (ESA) Expose-E mission. The paper says the significant findings provide evidence for the panspermia hypothesis that organisms travel from planet to planet on meteors and asteroids. There is growing probability that we are moving into a rapid temperature instability period similar to the one that took place 10,000 years ago. They returned with images and data showing that red-hot magma has been rising from deep inside the earth and blown the tops off dozens of submarine volcanoes, four kilometres below the ice. "Jets or fountains of material were probably blasted one, maybe even two, kilometres up into the water," says geophysicist Robert Sohn of the Woods Hole Oceanographic Institution, who led the expedition. There are no volcanoes exploding in the area right now, but they scientists say there appears to still be a lot happening on the sea floor. "I had the impression this whole central volcano area was oozing warm fluid," says Henrietta Edmonds of the University of Texas, who was on the expedition tracking the plumes of warm waters rising from the spreading ridge. The shortest distance from the Earth's core to the solid surface is at the artic pole. MANY UNDERWATER VOLCANOES ERUPTING SIMULTANEOUSLY ALL OVER THE WORLD ? tectonic disturbance steadily rising ?are we headed for a major catastrophe? Many researchers are now concerned about these developments. They are saying the probability of a mega or multiple mega volcanoes is very high now. According to some there is 74,000 year-cycle of mega volcanoes and that is due in 2012. All that energy from the 1970 sixty degree shift of the Earth's core has to go somewhere. The chances that asteroid impacts and huge bouts of volcanism coincide randomly to cause mass extinctions may be greater than previously imagined. Time series derived from this data showed that 10 major peaks in terrestrial impact activity were seen on Earth over this time period. Nine out of 10 of these impact peaks are directly matched by peaks in normal to strong mantle plume volcanism. Abbott and Isley"s research paper, "Extraterrestrial Influences on Mantle Plume Activity," is appearing in Earth and Planetary Science Letters this month (Jan 28, 2003). Dallas Abbott from Columbia University and her colleague Ann Isley from the State University of New York studied the timing of these 38 impacts and found that they correlate strongly with eruptions of "mantle-plume" volcanoes during the same period. Most volcanoes come from small amounts of the Earth's upper mantle boiling over, but mantle-plume volcanoes happen when hot rock from deep within the Earth's mantle shoots straight up through the Earth's crust. The timing suggests that these volcanoes are related to asteroid impacts, Abbott and Isley report in Earth and Planetary Science Letters (vol 205, p 53). The newly released video below is part 2 of BBC’s Yellowstone Supervolcano 'docu drama' that plays out a Yellowstone eruption scenario in its’ entirety. BBC makes clear at the very beginning of this video, this IS a true story….it just hasn’t happened yet. Not officially! But it should be raised to Yellow! How else you define increased activity? I've been monitoring this for a long time now, all the indicators point towards extreme Geological upheaval very soon, in the coming month's. What about this... the French Foreign Minister has a meeting with John Kerry and comes out with a very profound statement... "we have 500 days cleft before climate chaos," really, do they know something we don't? ? Is US Geological Service (USGS) keeping an eye on Yellowstone caldera and hiding data from the public? >What does the "Yellowstone eruption warning" from Unavco mean and just who is Unavco? Does the US have a contingency plan in place for a worst case scenario? Does the worst-cast scenario involve an evacuation plan? If Yellowstone erupts, will millions of US citizens be evacuated to Brazil, Australia, or Argentina? Scientists looking for a greater understanding of what causes supervolcanoes to erupt have come to an unsettling conclusion: They can erupt spontaneously and without any external trigger. 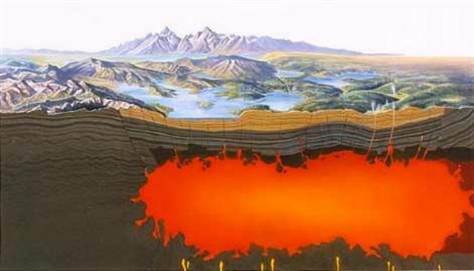 Depiction Of The Magma Chamber Under The Yellowstone Super-Volcano. This Oregon-Idaho-Nevada border area is where the giant comet hit 17 million of years ago. (7) WAS THE K-T EVENT A ONE-OFF? Hotspots, in the case of Tr-J this is presumably at the Azores. Rifts, as the Tr-J impact actually split the continents when the N. Atlantic first opened up. Prior to this, the continents of N America, S. America, Africa, and Europe where all connected. Large Igneous Provinces (LIPs): This massive killer impact that wiped out 80% of all life on Earth produced a supervolcano erupting the Central Atlantic Magmatic Province (CAMP) on all four of those continents. This is merely one of many LIPs, all presumably related to ET impacts. Hotspot Tracks: Eventually, geologists will agree on the thesis that hotspot tracks (of which there are lots) are indeed impact signatures, abandoning theories about "mantle plumes" with their origin in heating at the D layer at the CMB, as a part of large scale mantle convection. In the case of the Yellowstone hotspot, these supervolcano eruptions occurred at intervals greater than several 100 thousand years ago. The hotspot probably began 17.5 Million years ago with a crater remnant yet to be found. From the known plate motion, it should be in N. Central Nevada. However, there is a theory that explains hotspots not as plumes from the deep, but mostly stirrings in the upper mantle - its top 400 kilometers - caused from above by the movements of the crustal plates and surface-based cooling. At the Yellowstone hotspot, it was found that the transition zone is cool, not hot. Many hotspots are traced back to starting points at the edges of continents, during continental break-ups, that have since moved away. Comet impact could have caused the breakup of the continents. If you thought the eruption of Mount St. Helens in 1980 was a big one, it's possible you ain't seen nothing yet. According to an article in NewScientist, there may be a "super volcano" brewing under the mountain, which has been steaming and stewing since its notorious eruption on May 18, 1980. Examinations of a concept that could alter the world-wide weather are laid out and they suggest that a meteor or comet impact wouldn't be sufficient. Impact events has rapid consequences, while a long-lasting injection of weather- disrupting material requires a cause that isn't spent all at once. A volcanic eruption, like he one in Sumatra is inferred. The Sumatran history supporting the claim seems relatively weak but the geology is sound. Effects of this sort may correspond to a big eruption like the eruption of the Yellowstone volcano in the near future. There also appears to be a link between large impacts and volcanic eruptions. CAN IMPACTS INDUCE VOLCANIC ERUPTIONS? DID DOUBLE WHAMMY OF VOLCANO AND ASTEROID WIPE OUT DINOSAURS? Many scientists believed that an asteroid caused the mass extinction 65 million years ago. However, a new study points to a more complex event that began with a series of eruptions which took place in what is now north-western India. An eruption from Yellowstone could create an ash cloud that would affect the entire world's atmosphere for a decade or more. Yellowstone's last full-scale outburst occurred 640,000 years ago, and the ones before that occurred 1.3 million and 2.1 million years ago — but each of these events was a tad smaller than the one before it. This geologic hotspot could be growing cold. Or it might have one last hurrah. Yellowstone National Park is rising. Its central region, called the Yellowstone caldera, has been moving upward since mid-2004 at a rate of up to three inches (seven centimeters) a year—more than three times faster than has ever been measured. The surface is inflating like a bellows due to an infusion of magma about 6 miles (10 kilometers) underground, according to a new study published in tomorrow's issue of the journal Science. Yellowstone is situated on a giant, geologically active feature known as a supervolcano. "It's hundreds of times bigger than Mount St. Helens," Smith said, referring to the active volcano in Washington State. Much of the park sits in a caldera, or crater, some 40 miles (70 kilometers) across, which formed when the cone of the massive volcano collapsed in a titanic eruption 640,000 years ago. The supervolcano has produced three similarly large blasts in the past two million years, with 30 smaller eruptions since the caldera formed. The volcano's most recent flare-up was 70,000 years ago, and volcanic heat continues to fuel the park's famous geysers and hot springs. The land is rising because magma and hydrothermal fluids are migrating into the volcano's underground chambers, Smith explained. "It's really kind of a sponge, where you have interlaced open spaces with magma and solid rock between. Only 10 percent [of the chambers are] actually made up of molten rock." "Since ?about 14,000 years ago, the Yellowstone caldera has inflated and deflated about six to eight times without a volcanic eruption," he said. Smith agreed. "Calderas go up and down," he said. "We use the term 'restless' to describe these systems." But, he added, "occasionally they burp." Supervolcanoes can sleep for centuries or millennia before producing incredibly massive eruptions that can drop ash across an entire continent. Oddly enough, the image shows the plume does not rise from the Earth's core- mantle boundary at 1,700 miles (2,700 km) down. Instead, the column of magma appears out of nowhere some 310 to 400 miles (500- 650 km) down, under the Montana-Idaho border northwest of Yellowstone National Park. From there it tilts to the southeast as it rises through the mantle until it's directly under Yellowstone. It's tilted, which is interesting," said Humphreys. But how it got that hot, he said, "is still a mystery." Apparently, they are unaware of the eruption that blew dust out to the Pacific ocean. "Yellowstone is known to have erupted cataclysmically on three occasions in the past: 2 million years ago, when it spewed out nearly 600 cubic miles of magma; 1.3 million years ago, when it ejected 'just' 70 cubic miles of the stuff; and 630,000 years ago, when it generated about 250 cubic miles of magma. There has been much recent publicity about the possibility of a meteor or comet strike - like the one credited with wiping out the dinosaurs - and various contingency plans have been offered in national and even international forums. Surely we should not fail, while scanning the skies, to consider what is right here underfoot." Beloved for its pristine scenery and wildlife, America's flagship national park has been a setting for catastrophic eruptions. One changed the face of the continent. Three times in the past 2.1 million years, the park has blown its top, covering much of the country in deep layers of volcanic ash and wreaking havoc with global weather systems. The last big eruption was 640,000 years ago, and there have been 30 smaller ones since then. The most recent was 70,000 years ago. Recent eruptions, 200 degree ground temperatures, bulging magma and 84 degree water temperatures prompt heightened srutiny of park's geothermal activity... Then during the last part of July one of the Park geologists discovered a huge bulge at the bottom of Yellowstone Lake. The bulge has already risen over 100 feet from the bottom of the lake and the water temperature at the surface of the bulge has reached 88 degrees and is still rising. IS PRESSURE COOKER OF YELLOWSTONE SET TO BURST? But the geologists who explore the caldera - the collapsed supervolcano that is Yellowstone - share neither such alarmist doom nor faith in methods for taming the forces boiling underground. "The hazard . . . is almost too small to calculate." It still needs a little time. The Yellowstone hotspot, which powers Yellowstone National Park's geysers and hot springs, produced 142 huge volcanic eruptions during the last 16.5 million years - far more than the 100 previously known blasts, University of Utah geologists found. The cataclysmic explosions -- known as "caldera eruptions" -- typically generated 250 to 600 times as much volcanic ash as the 1980 eruption of Mount St. Helens in Washington state, and some were up to 2,500 times larger, covering as much as half the continental United States with inches to feet of volcanic ash. The Yellowstone hotspot - which many scientists believe is a plume-like zone of hot and molten rising from at least 125 miles beneath Earth's surface - produced its three most recent caldera eruptions at or near the present site of Yellowstone National Park 2 million, 1.3 million and 642,000 years ago. That 600 km radius around the caldera will experience total devastation. The next 600 km out may receive as much as 5-10 feet of ash, depending on wind direction. The thickness of ash will decrease away from the super-volcano, but will reach the crop belt in the Midwest (Missouri, Iowa, Kansas, Nebraska, etc. ), destroying most of the fertile croplands of the United States. California will be hit hard by falling ash, with its central wine valley severely damaged. Agriculture will have to shift east of the Mississippi for years. (US Geological Survey): Millions of people come to Yellowstone every year to see the marvellous scenery and the wildlife and all and yet it's clear that, that very few of them really understand that they're here on a sleeping giant. If this giant were to stir, the United States would be devastated and the world would be plunged into a catastrophe which could push humanity to the brink of extinction. You're getting a, an eruption which we can barely imagine. We've never seen this sort of thing. You wouldn't be able to get within 1,000 kilometers of it when it was going like this. Scientists are concerned about a 100-foot-high bulge in the bottom of Yellowstone Lake, saying it could have been formed by carbon dioxide or steam and that it could explode. Recent earthquake activity near Yellowstone National Park may be a warning about a "supervolcano". A 4.4 magnitude earthquake occurred just 9 miles southeast of the south entrance to Yellowstone National Park. When a supervolcano goes off, it is an order of magnitude greater than a normal eruption. It produces energy equivalent to an impact with a comet or an asteroid. After a 4.4 quake on 8-21-03, 9 aftershocks have occurred along with a resonance in the rock,which can cause softening of the rock. If a fissure occurs in the rock, everyone within 600 miles should be prepared for the sudden blast. If the Supervolcano blows, it will cause an immediate nuclear winter of dirt and ash in the air over the entire world for 2 years. There will be no crops grown in the midwest U.S. for that same period of time. The magma chamber is believed to be about 40 by 80 kilometers across, similar in size to the overlying Yellowstone caldera. The top of the chamber is about 8 km deep and the bottom is around 16 km deep. The seismic network has recently revealed a 3,600-cubic-mile banana-shaped body located a half-mile to several miles underneath part of Yellowstone. This chamber slows down seismic waves, which means it could contain 10 to 20 percent melted rock, Smith says. And a broader seismic array has just recently revealed an even deeper feature: a tilted pipe rising up through the Earth from the northwest, from 400 miles down. "It's this pipe that's bending over in the wind," says Ihinger. "That is at the heart of the matter." The "pipe" appears to be the track of a slow, viscous upwelling of hot rock from below the crust. The upwelling could cause rocks in the crust to melt, creating the magma chamber below Yellowstone. No. The fact that two eruptive intervals (2.1 million to 1.3 million and 1.3 million to 640,000 years ago) are of similar length does not mean that the next eruption will necessarily occur after another similar interval. 800,000 years 660,000 years are the intervals shortening as the comets continue to shatter rounding the Sun and increase the chances of an impact? A volcanic super-eruption could pose twice as much of a threat to civilization as a collision with an asteroid or comet. "When Yellowstone goes off again, and it will, it will be a disaster for the United States and eventually, for the whole world. We volcanologists believe it would all begin with the magma chamber becoming unstable. Observations would begin by seeing bigger earthquakes, greater uplifting as magma intrudes and gets nearer and nearer the surface. An earthquake may send a rupture through a brittle layer similar to breaking the lid off a pressure cooker. This would generate sheets of magma, which will perhaps rise up to 30, 40 or 50 kilometers sending gigantic amounts of debris into the atmosphere. Pyroclastic flows would cover the whole region, killing tens of thousands of people in the surrounding area. The ash carried in the atmosphere and deposited over vast areas of the United States would have devastating effects. A plume of material that goes up into the atmosphere, globally, from the eruption would produce the climatic effects. This would spread worldwide and have a cooling effect that would most likely destroy the growing season on a global scale. The eruption will throw out cubic kilometers of rock, ash, dust, sulfur dioxide and so on into the upper atmosphere, where it will reflect incoming solar radiation, forcing down temperatures on the earth's surface. It would be the equivalent of a nuclear winter. The effects would last for four or five years with crops failing and the whole ecosystem breaking down." We propose that the Yellowstone Petrified Forests provide an example of catastrophic deposition. WHEN WAS THE ERUPTION THAT TRANSFORMED YELLOWSTONE FROM A VOLCANO TO A STEAMING, BOILING, CALDERA? Yellowstone is the result of three very large eruptions. The first was about 2.1 million years ago and erupted 600 cubic miles (2,500 cubic km) of ash. It created the Island Park caldera about 45 miles (75 km) long. The second eruption was about 1.3 million years ago. It produced the Henrys Fork caldera in the west end of the older (2.1 million year) caldera. About 600,000 years ago an eruption produced about 250 cubic miles (1,000 cubic km) of ash and the present-day Yellowstone caldera. Since then there have been large volume (250 cubic miles; 1,000 cubic km) rhyolitic lava flows between 150,000 and 70,000 years ago. Yellowstone is still an active volcano. It sits above a hot spot and will erupt again. The agency ranks Mount Rainier as the third most dangerous volcano in the nation, after Kilauea on Hawaii's Big Island and Mount St. Helens. Both are currently active. Other studies call Rainier the most dangerous volcano in the world _ not just for its explosive potential, but because of the 3 million people who live in the Seattle-Tacoma-Bellevue metropolitan area. At least 100,000 people live on top of Rainier mudflows that have solidified. WHEN the Indonesian volcano Krakatoa erupted in 1883, sending 25 cubic kilometres of rock and ash into the air, it did more than generate the loudest sound ever recorded. It also cooled the world's oceans and suppressed rises in sea level for decades afterwards. There's a time bomb ticking under the Rockies. A 2,400-cubic-mile chamber of magma simmers beneath Yellowstone's geysers, and University of Wisconsin geochemist Ilya Bindeman says this geologic hot spot is due to blow. Unfortunately the findings don't offer a solution for surviving a future eruption, such as if the supervolcano underneath Yellowstone National Park in the US were to blow. "I'm not sure what we could do, except stay underground," says Sparks. The world is thinner at the poles and heat from the core rotation gets there faster. Around 74,000 years ago, a super-eruption tore a 60-mile wide hole out of the Earth in northern Sumatra, and blasted 10 trillion tons of ash into the air. Day turned to night, temperatures plunged and the human race was driven to the edge of extinction. Tonight's drama focuses on events following the discovery of tell-tale signs of a super-eruption beginning under America's Yellowstone Park - the site of three such cataclysms in the past two million years. And according to the scientists, we may be overdue for another one. Comparison of volumes produced by some of the greatest volcanic eruptions. The Young Toba Tuff has an estimated volume of 2,800 cubic kilometers (km) and was erupted about 74,000 years ago. The Huckleberry Ridge Tuff, erupted at Yellowstone 2.2 million years ago, has a volume of 2,500 cubic km. The Lava Creek Tuff, erupted at Yellowstone 600,000 years ago, has a volume of 1,000 cubic km. The May 1980 eruption of Mount St. Helens produced 1 cubic km of ash. Not shown is the Fish Canyon Tuff of the San Juan Mountains of Colorado. The Fish Canyon Tuff was erupted 27.8 million years ago and has an estimated volume of 3,000 cubic km. Scientists have identified a major climate crisis that struck Africa about 70,000 years ago and which may have changed the course of human history. The evidence comes from sediments drilled up from the beds of Lake Malawi and Tanganyika in East Africa, and from Lake Bosumtwi in Ghana. Worse still was Lake Bosumtwi. Currently a 10km-wide lake that fills an old space impact crater, it lost all of its water. Vast volcanic blasts that cause global devastation occur on average every 50,000 years ?and, as the last one struck 74,000 years ago, at Toba, Indonesia, another may be overdue. Super volcano eruptions and impacts from space may occur simultaneously. Mount Talang - A volcano spewed into life on Tuesday on Indonesia's disaster- blighted Sumatra Island, spreading new panic after the recent tsunami and earthquakes and driving thousands of people from their homes. Mount Talang, 40km east of Sumatra's coastal Padang city, began pumping out volcanic ash shortly before dawn, prompting scientists to urge people to move away from the fall-out zone. In geological terms, this is Toba's next door neighbor. AS IF earthquake-ravaged Indonesia doesn't have enough to worry about, now scientists warn that a Sumatran super-volcano might blow its top at any time. If it does, the blast will toss hundreds of thousands of cubic kilometres of rock and ash into the atmosphere, dwarfing the eruptions of Krakatoa, Mount St Helens, Pinatubo and any conventional volcanic explosion of the past tens of thousands of years. "These super-volcanoes are potentially the greatest hazard on Earth, the only greater threat being an asteroid impact from space," said Ray Cas, a vulcanologist with Monash University in Melbourne. The likelihood that the Toba - the largest super-volcano on Earth - will erupt has increased significantly due to geological stresses generated by the recent quakes. Worse, Toba sits directly atop the faultline running down the spine of Sumatra. That is where seismologists say a third quake might strike. Vulcanologist Stephen Self of Britain's Open University said a super- volcanic eruption might cover an entire continent with ash that could take decades to erode. "(Such an eruption) could result in the devastation of world agriculture, severe disruption of food supplies and mass starvation," he told the online journal Live Science. Professor Cas said super-volcanoes tended to erupt in 2000-year cycles. The Toba super-volcano last erupted 73,000 years ago. Could it be a 2500 year cycle? Giant tsunamis, super volcanoes and earthquakes could pose a greater threat than terrorism, scientists claim. . . Global Geophysical Events, or "Gee Gee's", as they are nick-named, are not being taken seriously enough, they say. Now this is all theory, as no living human has ever witnessed a supervolcanic eruption, but it is belived that the last supervolcano to erupt was at Toba in Sumatra, the biggest volcanic eruption the world had ever seen, 10,000 times the size of the 1980 Mount St. Helens eruption, blowing a big 100 kilometres by 60 kilometres hole in the earth that is now known as Lake Toba. The likelihood that the Toba ?the largest super-volcano on Earth ?will erupt has increased significantly due to geological stresses generated by the recent quakes. Worse, Toba sits directly atop the faultline running down the spine of Sumatra. That is where seismologists say a third quake might strike. "It could be in a few, 50 or another 1000 years but sooner or later one is going to go off." Other super volcanos are found in Italy, South America, the United States and New Zealand - where Mount Taupo could be ready for eruption. Keys examines phenomena that could mess with the weather world-wide. He lays out reasons to believe that a meteor or comet impact wouldn't do the job, and this is more convincing than I was expecting it to be. I, um, I didn't take into account that of course an impact event has its biggest consequences very very rapidly, while the sort of long-lasting injection of weather-messing crud he describes requires a cause that isn't spent all at once. He proposes a volcanic eruption, and has a candidate in mind: a particular volcano in Sumatra. The Sumatran history he uses to support the claim seems relatively weak to me, though that might be presentation, but the geology is sound. He concludes by summarizing the effects of this sort of big eruption and applying them to a prospective eruption of the Yellowstone volcano in the near future. This is interesting news. If the conclusions the researchers have reached is correct, might this near extinction be linked to the catastrophic eruption and aftermath of the super-volcano Toba in Sumatra (around 72,000 BCE)? CHAMPAIGN, Ill. -- A new hypothesis about recent human evolution suggests that a horrific "volcanic winter" 71,000 years ago, followed by the coldest 1,000 years of the last Ice Age, brought widespread famine and death to modern human populations around the world. The abrupt "bottleneck," or decrease, in our ancestors' populations, in turn, brought about the rapid "differentiation" - or genetic divergence - of the surviving populations. The hypothesis, offered by anthropologist Stanley Ambrose of the University of Illinois, proposes that a volcanic winter reduced populations to "levels low enough for evolutionary changes, which occur much faster in small populations, to produce rapid population differentiation"
Ambrose has linked geneticists' research to that of volcanologists Michael Rampino, Stephen Self, Greg Zielinski and colleagues, which shows the super-eruption of Toba caused a volcanic winter that lasted six years and significantly altered global climate for the next 1,000 years. Those six years of "relentless volcanic winter" led to substantial lowering of global temperatures, drought and famine, and to a global human population crash during which, if geneticists are correct, no more than 15,000 to 40,000 people survived. Whether volcano or comet strike induced, this weather changecould have been what killed off the bulk of the Neanderthals and offered an opportunity for modern man to establish a foot hold on Earth a few tens thousand of years later. The USGS calculates that Mount Rainier burps this way every 500 to 1,000 years. Global geophysical events, such as huge tidal waves or volcanic super- eruptions, could devastate the planet - so why doesn't anybody care? The Deccan Traps formed between 60 and 65 million years ago, and the gases released in the process may have played a role in the extinction of the dinosaurs.